I've always been a fan of non-fiction, but YA non-fiction is a genre that I never read. Why is that? Partly it's because I forget about it. Partly it's because YA non-fiction rarely gets any buzz. Partly because I feel like *typically* YA non-fiction is of lower quality than adult non-fiction. Admittedly, this is unfair, but I think it's a bias that many others share. Bomb received a lot of buzz when it came out in 2012. And boy was it deserved. This is the perfect book for lovers of history - World War II and the Cold War in particular, for lovers of science, for lovers of spy thrillers, and more. The book is more fast paced than many novels I've read. It essentially tells three separate stories. 3: The Soviets attempt to steal atomic weaponry secrets from the US via spying. The separate narratives were broken up by chapters. Generally, there would be two short chapters on one story line and then the book switched to a different story line. This easily could have made the book feel choppy, but instead it kept everything fresh and exciting. It was leading us to the edge of a cliff and letting us danger for a few chapters before pulling us back up. Bomb is written at the reading level of younger YA. I think most middle schoolers could handle it with ease. Still, it's complex enough and substantively rich enough that I didn't feel like I was reading "down." It has material that would interest any adult and is presented in a much more approachable manner than many adult non-fiction books. If you're a history buff like me, you must pick up Bomb. It's a good reminder to me to give YA non-fiction more tries. 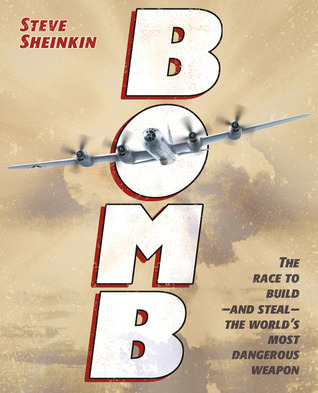 Bomb is wonderfully readable, well-written, and chockful of fascinating information. Always good when there's a fast-paced and interesting YA nonfiction book -- they're rather rare creatures! I'm SOOOO glad you liked Bomb. It was one of my favorite books that I read last year. Sheinkin is an amazing writer. He also wrote another middle grade nonfiction title called The Notorious Benedict Arnold and that's fantastic too! You should give it a try. I haven't been able to think about Benedict Arnold the same way again. Not a big history buff but I like taking trips back in time. It sounds very good. I'm not much of a nonfiction reader but I do get drawn to books that are more narrative than have a dry, textbook feel to it. I've read lots of great reviews for this one but I was a bit too burned out by all the WW II stuff lately that I stayed away for a while. It's still on my tbr and I hope to read it soon. I guess this book is calling me. I've picked it up several times, but not being a big fan of non-fiction, I'm hesitant. But with two bloggers telling me this is well done, I guess I need to grab it and really read it this time. Thanks!